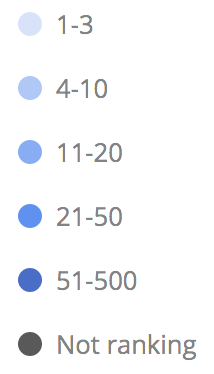 Ranking Distribution shows all your keywords in six different levels. It is placed on the overview tab for a given domain. In this graph, the rankings are split into six different groups according to range - i.e. : range 1 - 3. (see picture below). This enables you to quickly see if the keywords that are ranked in these particular ranges are going up or down. In case your keywords won't be ranked, you will be able to see that too. 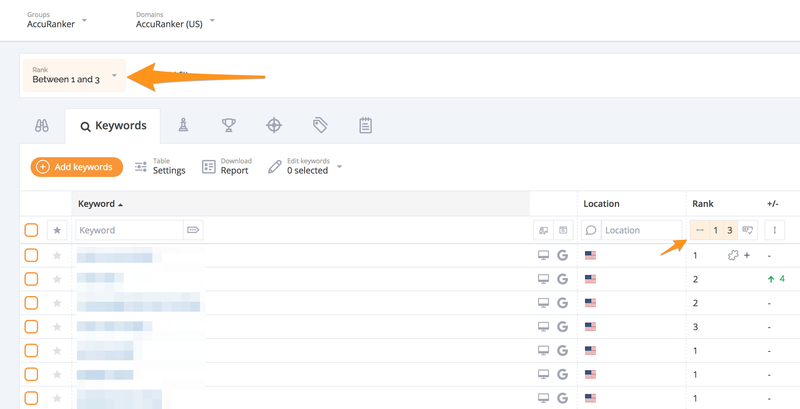 If you would like to see the exact amount of your keywords and know what specific keywords are performing well in rankings, unclick the ranges, that you do not want to analyse at that time and you will get the data that you want to see. For example: If you want to check which keywords are appearing in range between 1-3 in Google or Bing searches, then click on other levels that you don't want to see and the data you are looking for will be displayed. Then click on the specific day that you want to check, since each day you will get different amount of keywords that are performing the best and probably the keywords will be different as well. Therefore it's a good way of checking the performance of your keywords and tracking the best ones. By moving the cursor of your mouse onto a specific day (you can see the timeline on diagram), data will be shown for that day. You can also click on a ranking segment, to see the keywords. This graph can also be included in a report. By clicking on the icon next to levels you can download this data in many formats. You can choose to go as far back as when you first added your domain by selecting the date selector on the right corner of the website. Want to see which keywords have moved up and and down in rankings? Click here to read about "Winners & Losers"